I went to my friend Lisa's backyard birthday party a few years back, and her friend brought the most amazing dessert/salad. It was cool, refreshing, sweet delicious, addicting, and went perfectly with the rest of the potluck. Matter of fact if you have a party or gathering to go to this summer, well I highly recommend you bring this dish! People you've never met at the same party will hunt you down and not leave your side until you write this recipe down on a party napkin. It's that good. Behold I give you... Creamy Grape Salad. 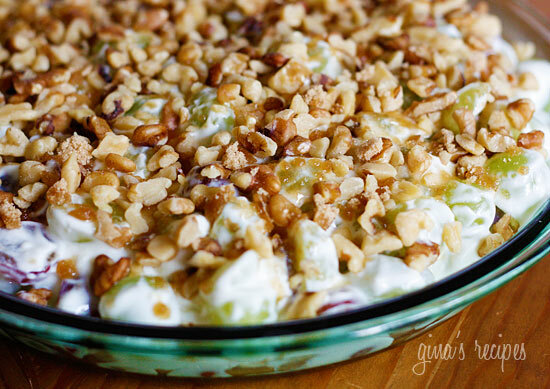 I have to thank Gina over at her blog for this beautiful picture of the grape salad. I realize that every time I'm near one, my only goal is to get it on a plate and stuff it in my face, and for some reason after that, I always forget to take a picture of it before it vanishes completely. This recipe is the regular (full flavor) version. the 1/2 tsp vanilla, and the 3/4 cup brown sugar. Add this mixture to the 4 lbs of grapes and mix gently together. Put entire mixture into your serving bowl you are taking to the party. Mix together equal parts of pecans and brown sugar (you can do as little as 1/2 cup each, or add more to taste). Sprinkle over the top of the salad and chill for at least two hours. That's it! The chilling part is really key, as the flavors meld the the brown sugar makes everything extra yummy. When you serve it, at first people might look at it a little funny. It does sort of look odd with its white lumps and sprinkle of nuts. But I promise you, once people get a taste of it, they will come back for seconds, and then thirds. I think if a grape pie existed, this is what it would taste like. Enjoy!